Update: 'Rusty The Panda' Has Been Found, National Zoo Says : The Two-Way The little guy is safe after spending part of Monday on the lam, zoo officials say. About the size of a house cat and resembling a raccoon, he was spotted in a neighborhood adjacent to the zoo's grounds. "Rusty the Panda" spent part of Monday on the loose in D.C. He was spotted by residents in a neighborhood next to the National Zoo's grounds. "Rusty the red panda has been recovered, crated & is headed safely back to the National Zoo!" That's the breathless update from the National Zoo, announcing Rusty's return to safe hands Monday afternoon. The zoo followed that tweet with a note of appreciation: "Thank you so much to everyone who helped us look for and find him!" It seems that Rusty was spotted in the Adams Morgan neighborhood, which borders the park lands around the zoo. Residents snapped photos and alerted the park via Twitter. Washington's City Paper reports that zoo employees used a net to maneuver Rusty into a crate. The wayward red panda had evidently climbed a tree next to a house. As news of the animal's capture spread, we also noticed that Twitter suspended the "Rusty_thePanda" account that was created Monday morning. The feed's humorous tweets likely tipped officials off; red pandas are not known for their sense of humor. 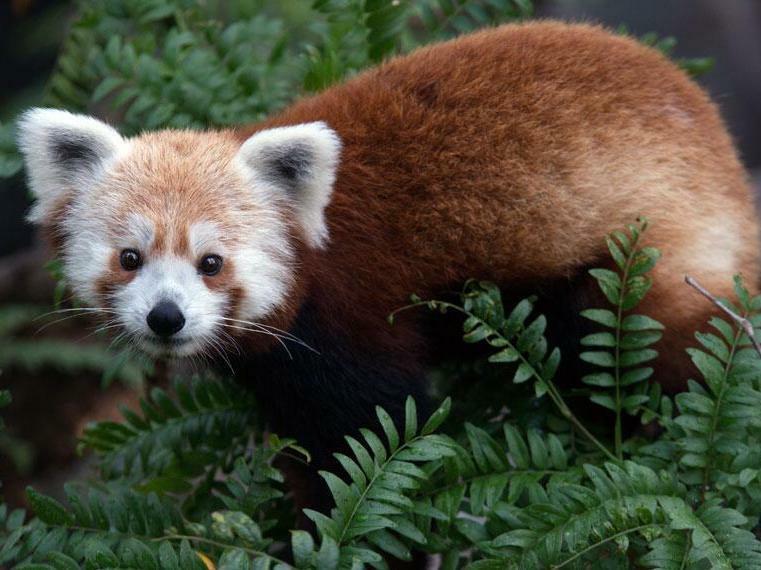 There's a red panda missing from the National Zoo in Washington, D.C., zoo officials announced Monday morning. "Remember: red pandas are wild animals, & will bite if cornered or scared." "Red pandas typically spend the warm daytime hours resting, so it's likely Rusty is somewhere in or near the Zoo hiding in a tree." Oh, and he may have a smart phone or tablet. Following the trails blazed in 2011 by "Bronx Zoo Cobra" and "Bronx Zoo Peacock," a "Rusty the Panda" popped up Monday on Twitter, as did "@Rusty_thePanda." "Sorry @NationalZoo, it's just such a beautiful day out. I'm hitting the town! @BronxZoosCobra let's meet up?" "Does anyone else think that Jay Carney and I kind of look alike? #pandasfromanothermother"
Bronx Zoo Cobra, by the way, was found sssafe and sssound.